Madly floriferous, densely branching sunflower fires up a radiant blaze of blooms. Vigorous, long-flowering 'Treasure Mountain's plants produce 10-12 stalks shimmering with 8-10 inch golden-yellow petaled flowers with expressive big brown eyes. Color-saturated blooms make for dazzling cut flowers, a single vase illuminating your dining room. Thanks to extended flowering time and flower-packed habit, a swathe of sunflowers forms a luminous wall of gold as a background planting in sun-soaked sites. Wide spacing ensures fullest branching. 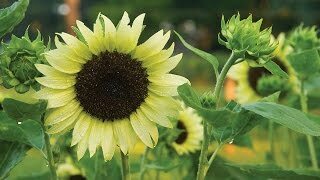 Sunflower, Treasure Mountain Hybrid is rated 4.3 out of 5 by 6. Rated 5 out of 5 by Sunflower Guy21 from Amazing Flowers. Grew Enormous I bought this to go alongside my house and it was an awesome plant, will buy again. Rated 1 out of 5 by Longmary from Disappointed These seeds never came up. My entire order to Burpee was a disappointment. While some of the other seeds did break ground- nothing has had decent blooming. The zennias are just now getting some buds with only 4 of them in bloom so far. In the future I will go back to buying my seed products from the box stores. Way less money and hopefully better results. Rated 5 out of 5 by home gardener2 from my garden I love sunflowers and this is the most beautiful of all thank you.